Searching for a potential mate can be fun and exciting but at the end of the day, finding that special someone is never easy. The situation is unfortunately much more problematic for the lowly Gothic singles of the world. But don’t blame yourself for this because that just wouldn’t be right. I mean, it’s not that we’re bad people or anything… it’s just that good people who like bad things are hard to come by! Thus, the journey of each and every Gothic couple usually starts off with some social group of Goth outcasts, banding together because misery loves company. Sooner or later, closeness by proximity is mistaken for attraction and the next thing you know you’re 37 years young and waking up next to your “dark soulmate” who has suddenly taken an interest in floral arrangements and badminton with her dingbat friend, Susan. What the hell happened?! In the end, it takes an incredible amount of patience and effort, not to mention sheer luck, to find that one person. Just consider the number of factors involved! From physical attraction to personality to sexual compatibility to likes and interests… the list goes on and on and chances are you will never find someone exactly compatible with you and all your idiosyncrasies—not in this lifetime at least! To make things worse, when you have a penchant for blood-sucking and the macabre, the odds really start to stack against you. This is why I decided to check out some Gothic singles dating sites online and give you the lowdown in my latest EPIC post: The Great Gothic Singles Dating Site Round-Up. I can help out weed through all the BS results out there and it will at least help me get back out on the market by giving me a chance to meet some cool Gothic hotties in my area! So, let’s not waste any more of your time… let the round-up BEGIN! PLEASE NOTE: I will only include results on the first page of Google and I will unfortunately exclude every site that isn’t in English. It’s not my fault that I can’t understand you… AMURICA! From what I can tell, GothicMatch.com is the number one way to meet like-minded Goth singles online. I mean it’s literally at the top of the Google search results. Unfortunately, when I try to access their site from my laptop I keep getting a 404 Forbidden message. So, how come these guys are on the top spot when I search for Gothic singles on Google? Well, I kept on digging and found their Facebook page (which was ranking 6th by the way) and checked it out. These guys haven’t posted anything since November 2012! 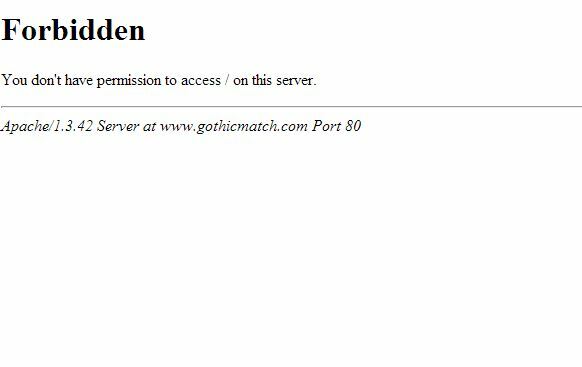 OK, this site seemed kind of cool… it has a Find-Goths-Near-You search engine on the frontend and actually gave me over 600 Goth women results in my area right off the bat. Well, too bad it won’t let me create an account! Wait, let me rephrase that… it lets me create an account and then immediately deactivates it upon my FIRST log in! What the hell is going on, folks?? I tried 3 times and all my attempts resulted in the same BS “reactivate your account” message. What’s the point of letting people know that there are over 600 potentials in their area if you’re not gonna let them sign up? Pointless! Furthermore, some poser has already taken my GOTH4LYF username! Now this is more like it! No sign up problems here, whatsoever. I just put in the usual information (Name, Birthday, Description, etc.) and within minutes, there I was, flying through their “Top Rated Photos” area, checking out profiles of some of the cutest Gothic singles I’ve seen in a while! There is a search function as well and you can search for Gothic singles by location, music tastes, and even photo rating, so it was super easy to narrow down my prospects. There’s also a forum area for discussions and a chat area to get some instant Gothic singles interaction upon signing up! Altscene seems to also be skewed towards music and music fans in general so if you’re into bands this may be the place for you. ATTENTION: It would be important to note, that there are some major babes on this site, for sure… too bad they aren’t in my area per se but it sure makes browsing profiles easy on the eyes! GothPassions.com is another Gothic singles dating community that I found and seemed pretty robust at first glance. They had a LENGTHY sign up process that forced you to lock in your location and fill out a super long data sheet of information and that was fine… at first! Unfortunately, after I spent way too much time answering these items, I was disappointed to find out that the next page was upselling me several other dating sites that were detailed towards the items I had answered! As far as I can tell, it seems that GothPassions is part of a bigger “passions” dating site network that has all sorts of communities targeted to your likes and interests like ParanormalPassions.com, HorrorPassions.com and BungeeJumpingPassions.com… I think you get the idea. What a waste of time that sign-up procedure was! If I wanted to find out more about bungee jumping singles in my area, I would have Googled that in the first place! Anyways, I decided to give the GothPassions singles site a chance since I had already spent so much time creating the account and I was generally unimpressed with the sites appearance and overall vibe. Maybe it’s because the interface seems a bit dated or maybe it’s because the site only really seems interested in filling up your page with ads. Either way, I felt myself missing all those pretty profiles on Altscene the longer I explored GothPassions.com. That can’t be a good sign. This site also has a search function but, much like the sign-up process, it was overly complicated. It seemed like I had to input WAAAAY too much information just to check out some Gothic hotties in my area. The Forums were also very cookie-cutter and just as dismal. No thanks, GothPassion… I think I’ll pass! GothicSinglesChat was another potentially great destination marred by some otherwise avoidable technical issues. The site has a modern, clean look to it and even signed me up to a partner site MeetLocalGoths.com simultaneously (way to keep it within my actual search terms). Two birds with one stone, right? Nope! Jesus! All I want to do is meet some hot Gothic singles. IS THAT TOO MUCH TO ASK?? OK I decided to give this one a shot too… I mean I was signed up for free, right? As expected. It’s hard enough that we’re Goth and single and looking for love in all the wrong places and now we have to deal with all these buggy Gothic singles sites as well?? It just ain’t fair, I tell you. So, those are some of the top results on Google when you search the term “Gothic singles”. If you’re lonely and longing for your next dark-hearted companion, I’m sure you’re just as disappointed as I am. The fact of the matter is that if you’re Gothic and single in 2014, there aren’t a lot of dating site options available out there—ones that work off the bat at least. Maybe I should try my luck on some apps perhaps? What IS clear is that the Gothic singles market has plenty of room for growth! If there are any Goth social community developers out there in GothicDecor land, now’s the time to put up a brand new Gothic singles dating community! Lucky for all you beautiful Gothic singles gals, you can check me out on Altscene.com/goth_dating_site in the meantime. It’s easily the best find on this entire post. It’s a quality site that’s easy to use and straight to the point with loads of cute Goth hotties to pick from! You can check it out by CLICKING HERE. It’s never too late to rekindle the black flame in your dark Gothic hearts… all you need is a little patience and an awesome Gothic singles dating site and you’re set! If anyone knows of any good Gothic single leads out there, let me know in the comments below. Find the Goth hottie of your dreams and live Gothic today!